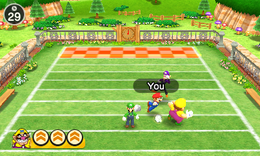 Tackle Takedown is a 1-vs-Rivals minigame featured in Mario Party 9. It returns in Mario Party: The Top 100. The screen shows the rivals standing by a football. One of the rivals kicks it into the air. The camera zooms out as the solo player catches it. The solo player attempts to reach the goal line without being tackled by a rival. The solo player has either three or two speed boosts for outrunning the rivals, depending on the number of opponents. If rivals tackle and miss, they fall and lose some time. The rivals win if one of them successfully tackles the solo player or if time runs out. If the solo player is victorious, he or she will spike the football and strike a victory pose, while the rivals groan. "Hold the Wii Remote sideways. Press to move and to sprint. You can sprint as long as you still have a sprint icon remaining." "Hold the Wii Remote sideways. Press to move and to tackle." Rules – "The solo player must run for the goal line while avoiding tackles from the other players." Description – "All you have to do is run the ball to the end zone! That, and dodge the other 3 players trying to tackle you." On-screen (Solo) – "Dodge the defensive line and score a touchdown!" On-screen (Team) – "Tackle the runner!" Torai o kimero! Go for the Try! French Bien essayé! "Nice try! "; Essai is a rugby or American football point. Mùbiāo dá zhèn! Goal Touchdown! This page was last edited on August 4, 2018, at 09:49.